I re-use plastic grocery sacks for so many things–they are a hot commodity at our house! I save them and use them on a very regular basis not only in my house, but on the road. I keep a bunch in the car so I’ll have them when I need them, for any variety of reasons. Whether it’s a pair of muddy shoes, wet clothes, a child that’s sick, or a million other things, grocery bags regularly save the day! You can probably relate–there isn’t much worse than a crazy mess when you’re away from home, and being stuck without anything to wrap it up in (and perhaps contain the smell!) until you get home. 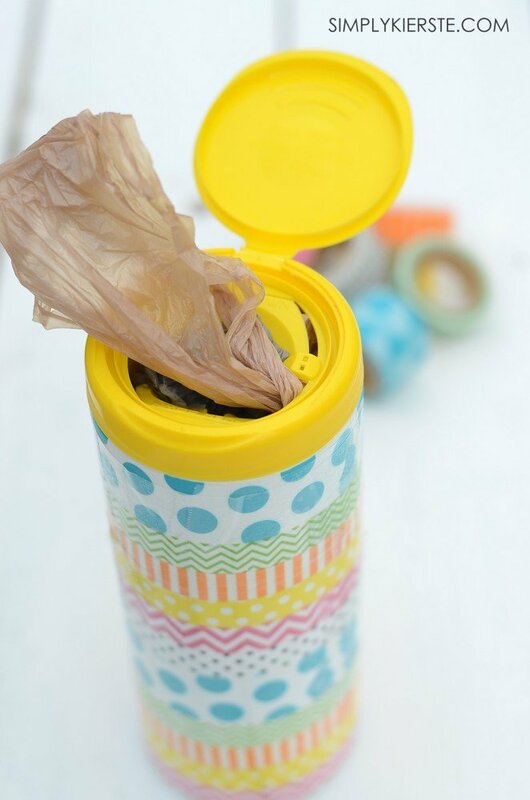 Empty Clorox wipes bottles make perfect grocery bag containers, and they make it so easy to pack them in the car, or even a diaper bag. I decided to dress mine up with washi tape, and in literally 5 minutes, it was transformed. Cute + functional + simple = my favorite combination! 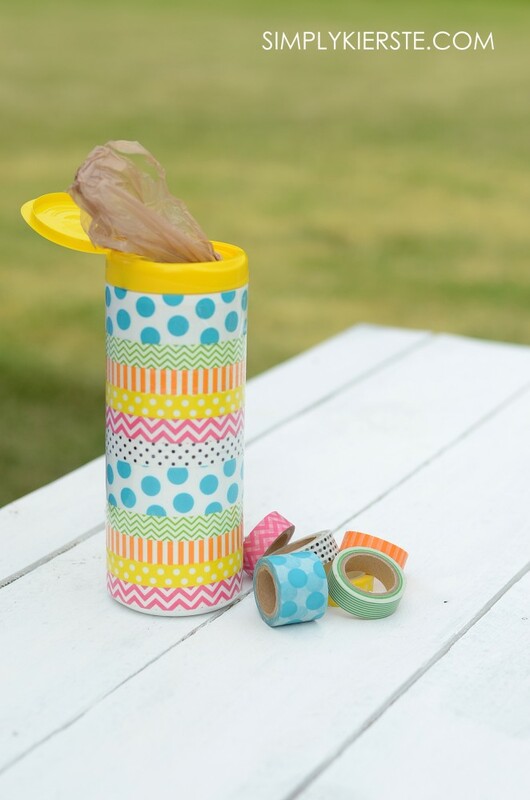 I’m pretty much in love with washi tape, and everything it can do and make cuter, and in just a few minutes, it takes this empty Clorox wipes container from drab to fab! 1. Rinse your wipes container, and let dry completely. Remove the label, and wash the sticky stuff off. If you can’t get it completely off, don’t worry–the washi tape will cover it right up. 2. Apply your washi tape! Start at the top, and carefully wrap a piece of washi tape around the container, until it’s gone all the way around. Overlap it by just a little, then tear it off the roll. Repeat the process all the way down the container, making sure to start and stop in about the same place. I lined up each row directly next to the other. I lucked out, and it ended up being the perfect amount of rows for my container! 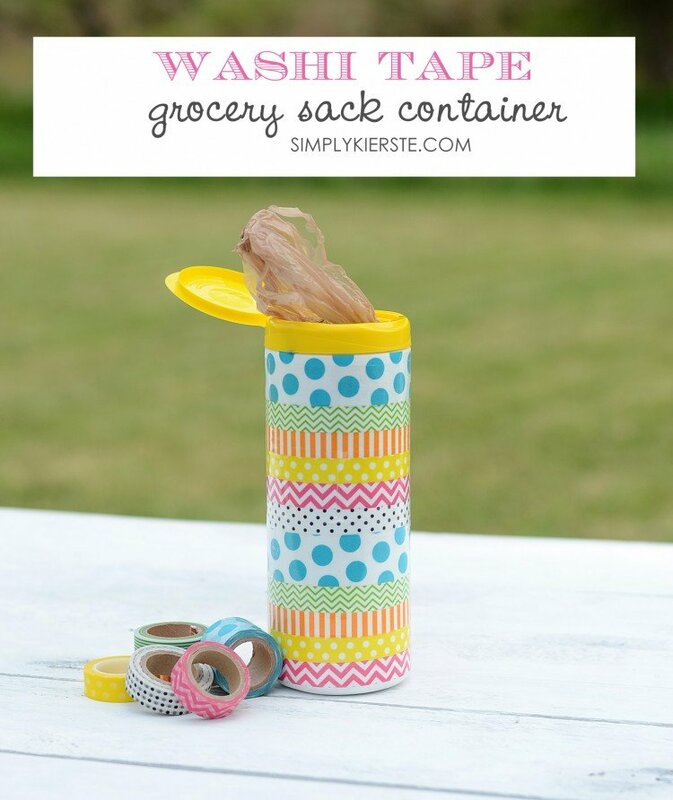 If yours isn’t, you may just need to trim the last piece of washi tape so it ends at the bottom of your container. 3. I used clear packing tape to cover the washi tape, just to give it some longevity. Washi tape tends to curl in heat and humidity, and with constant handling, I didn’t want it to peel off. 4. Fill the container with grocery sacks! You can try and roll them so that you can pull the handles out one-by-one just like the Clorox wipes, and I’ve tried several different ways, but none of them worked for me. If you know of a fool-proof way to do it, let me know! I just open up the cap and take one out if they won’t pull through, but it’s usually fine. I keep mine in my car kit (which I’m sharing this week! ), and then refill as necessary. It’s perfect!!! I love this for the car! I have something that I use in the house but this would be perfect to take on the go. Thanks! I, too, keep grocery sacks for so many things. I have some in the house and some in the shed. I currently keep mine in an old kleenex box. But I like your storage idea better! Thanks for sharing. how do you wrap the tape with getting any wrinkles? I meant without getting wrinkles, thank you. Which tape—the washi tape, or the packing tape?